Last week on the Twitch Fitness blog we wrote about some tips to fit some daily exercise into a busy schedule. This time we want to offer a few tips about how to get the most out of your workout when you do have time to stop by for an exercise class. Our Twitch fitness classes range in length from 45-60 minutes, so even if you are short on time, you can be in and out of the gym in under an hour. Start your warm-up before you get here: Doing a light activity before a workout is a great way to get your heart pumping and to warm up your muscles before you start to truly push yourself in a workout class. If you live or work within walking distance, change into your gym clothes and walk to the Lagree Studio. Doing this will ensure you’re already warmed up before class starts, and also allow some time for fresh air and peace after a long day at work. Be sure to fuel up: Working out on an empty stomach can seriously impact the effectiveness of your workout, making it difficult to expend as much energy as you normally would. If your class is scheduled at the end of the workday, you’re probably pretty hungry and dreaming of dinner. Eat a small snack like a banana and peanut butter or some toast to ensure that your body has the energy it needs to work up a sweat. Repair your muscles: After a workout, it can be tempting to eat the first food you come in contact with, but making sure that your food has the right kinds of nutrients to repair your muscles and replenish your energy is a must for getting the most out of your workout. To do this, choose a meal that has both carbs and protein. During an intense workout, your body burns glycogen for energy. The sooner you replenish the glycogen stores through carbs, the better you will feel. Similarly, exercising breaks down muscle tissue which can result in being sore after a workout. Consuming healthy proteins such as chicken or nuts can help your muscles repair themselves and get you ready for the next workout. 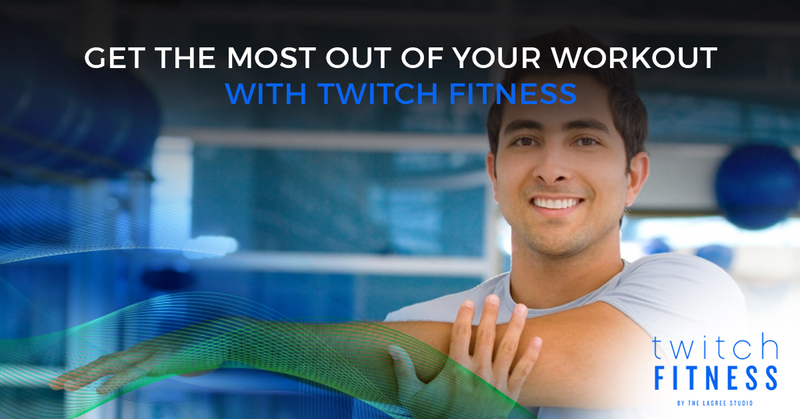 At Twitch Fitness, by The Lagree Studio, our group exercise classes are designed to give you a highly intense workout in a short amount of time. With three locations throughout Austin, you’ll never have to search the internet for “gyms near me” again. Reserve your spot in a Twitch Fitness class at our Hill Country Galleria, Arbor Town Square, or Downtown Austin gym today!